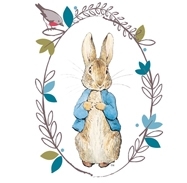 This cute Peter Rabbit organic dinner set is perfect for simple, mess free mealtimes. Made of organic bamboo, and decorated with traditional illustrations from the tales of Beatrix Potter, this dinner set makes a thoughtful gift for little ones. This set of a plate, bowl, cup and cutlery features Peter Rabbit surrounded by lettuce and flower pots on the bowl and cup, whilst the plate is decorated with the quote, ‘Eating too much lettuce makes me sleepy’, in the shape of a tree. The design is set against a cream background surrounded by blue edging, and is embellished with a pattern of leaves and polka dots. This eco-friendly dinner set is the perfect way to introduce a new generation to a cherished classic.